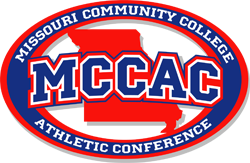 The Missouri Community College Athletic Conference sponsors competition for conference championships in men’s and women’s basketball, baseball, softball, men’s soccer and women’s volleyball. Currently, there are not enough women’s soccer teams to support a conference championship as conference bylaws require four teams to compete in a particular sport to award a championship. The conference boasts numerous NJCAA national titles in each of sponsored sports by the member institutions over the years. Former and current member institutions have won over 40 national championships. In the past, the some conference members had teams in wrestling, judo, track, cross country, tennis and golf. Mineral Area College sponsors the lone golf team in the conference at this point in time.